We had such a huge response to the essential oils giveaway! Thanks to each and every one of you who entered and left such nice comments. I wish I could respond to all of you:). If you have any questions about essential oils and how to use them, please feel free to contact my dear friend Beth at bethw@wrayjournal.com. She is incredibly knowledgeable...and sweet as pie. I would love to win the lemon oil and give it a try! This interests me - I don't know much about essential oils, but this has really sparked my interest! Thanks and love your blog! Thank you for offering this giveaway :) It's so hard to choose, because they all look wonderful, lol! I'd love to try the Wild Orange oil...and my 2nd choice from DoTerra would be the Invigorating Blend. Thanks again! Please contact me at julia.ablissfullycontentlife@gmail.com to arrange delivery:)!! I am so excited for you:). And on another note, are you busy preparing for Easter? On this Good Friday we talked about the death and resurrection and dyed our beautiful brown eggs...and one white one from the store:). Brown eggs turn out so unique and lovely after dyeing! I have a few more pansies to plant, but there was snow on the ground again this morning! I think I'll wait until tomorrow:). I have some pretty flowers on my table...awaiting more Easter decorations. We made a few glittery cards this morning to attach to gifts. Laurel, from The North End Loft ,has a lovely tutorial and free printables! 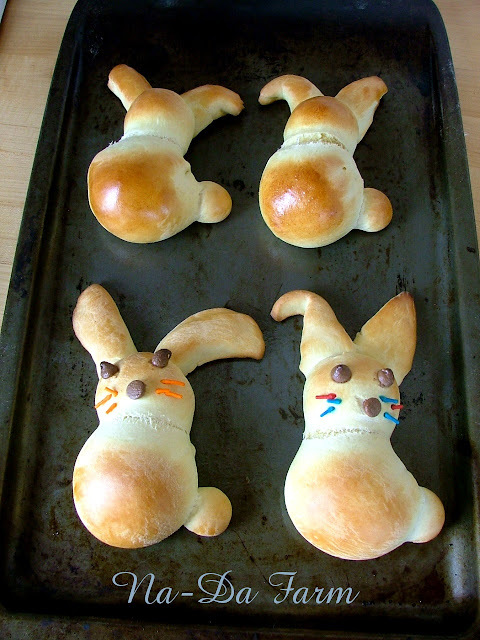 And...at this very moment I am making Bunny Breads for the kids for Easter treats. 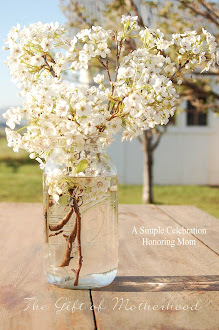 You can get the recipe from my sweet friend, Anne Marie at Na-Da Farm. Lastly, I am so excited to get into beekeeping! Here is my beehive and supplies ready to assemble. I am hoping to share what I learn as I go and have a whole beekeeping section on the blog. Wishing you a blessed Good Friday and lovely Easter. We are off to get baby chicks this afternoon and I hope to post about our Easter on Monday! It is such a wonderful time and I hope that you have a sweet day full of good memories. What a great post for Easter! A most Blessed and Happy Easter to you yours. What wonderful ideas for decorating. We most certainly will enjoy our Easter. A perfect Good Friday -- dying eggs, baking bread, decorating cards. You're a good mom. We have always had brown eggs to dye, but I always have bought a few white Leghorns so we had at least a few white eggs to dye. They are excellent layers. Looking forward to your Easter post. Blessed Easter to you and yours. Yes, yes! I can't wait to read about your bee-keeping experiences! The little dyed fingers holding the colored eggs in your photos took me back to past Easters with my own children who are grown now. It's the sweetest picture of a sweet time. Those Easter tags with the glitter around the edges turned out really cute. Thanks for sharing them. Really... thank you so much. Happy Easter to you and your beautiful family. Such peaceful & beautiful pics of preparing for Easter, at your home. And I just love how your eggs turned out! Wishing you and your family a joy-filled and blessed Easter! A very happy Easter to your family!